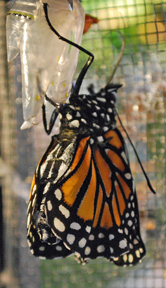 The first one to form a chrysalis started to darken yesterday. 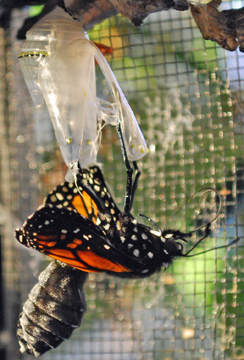 Actually it looks dark, but what’s happening is that the chrysalis is becoming transparent, so you can see the butterfly inside. Soon you can see the pattern and color of the wings. I took the photo above around 3:30. I was running upstairs every so often to check, but I finally just settled down next to the butterfly house with a book. 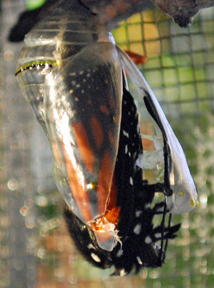 I looked up at about 4:15 and saw that the chrysalis was cracked! 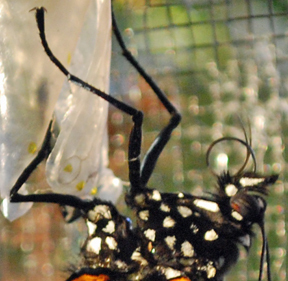 The butterfly holds onto the chrysalis with its legs – the wings and body drop out. The picture above shows the abdomen hanging down. 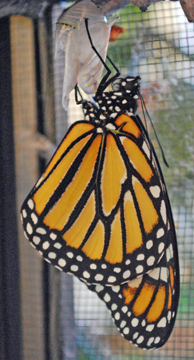 The abdomen is filled with fluid that the butterfly uses to inflate its wings. The wings are filling and lengthening. 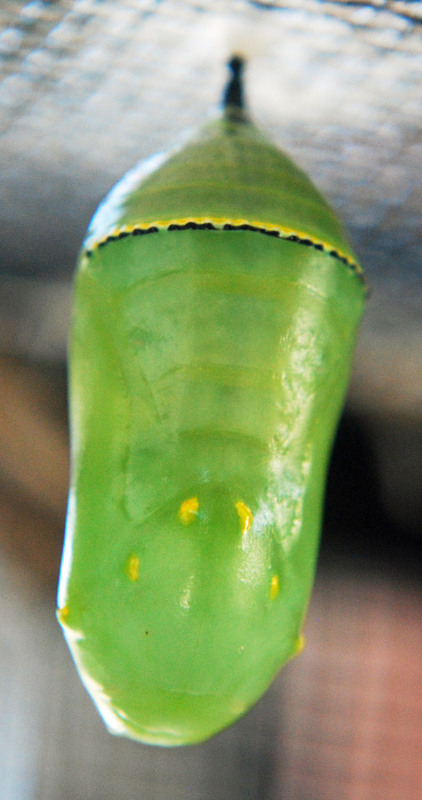 This is an extreme closeup showing the curled proboscis, and the legs holding onto the chrysalis. 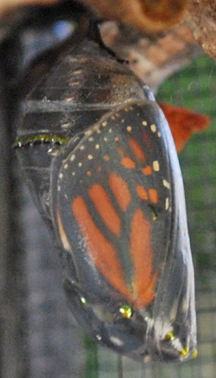 The forewings are now showing (peeking out from under the hindwing at the bottom right). The forewings continue to lengthen. 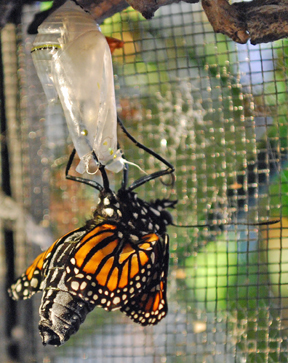 And finally, about a half hour after the butterfly began to emerge, it’s in its final form. 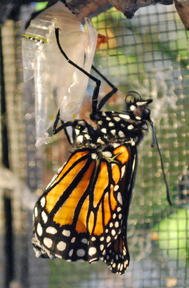 It continues to hang, letting its wings dry and harden. Soon we’ll release the butterfly, to continue the cycle! 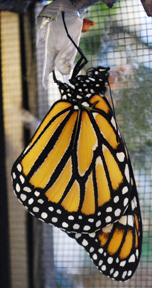 This entry was posted in Insects and butterflies, Nature art and tagged "butterfly eclose", "butterfly ecolosing", "butterfly emergence", "butterfly emerges", "butterfly emerging", "monarch butterfly", "monarch emerges", butterflies, chrysalis, eclose, monarch. Heidi, your photos — as always — are truly amazing. Thank you for taking us along with you on this journey!